Art and sound assets for all the SYNSO games released for you to use, abuse within your own games. Make your own games with them, make a SYNSO game with them. It's up to you. Hello again, ModDB folks. 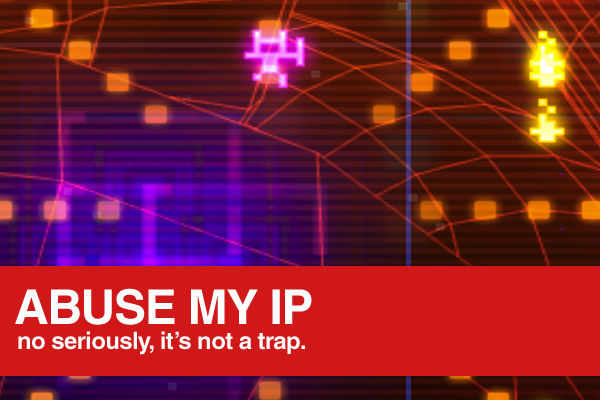 I want you to abuse my IP and make games. Whilst I've been working (admittedly slowly) on the follow up to Squid Harder, I've been thinking a lot about what an absolute pain it was to get started making games. Making sound effects whilst second nature now (and much easier thanks to tools such as SFXr) was a mystery, drawing even the most simple of sprites seemed like not so much a tiny step but a mountainous one. I also got to thinking about whether there was anything I could do to help bridge that gap. Well, I've got some games I've made and I've got some graphics and sound I made for those games so, well, why not put them all out there for other people to use? Sure, they're not exactly going to be found in Gears Of War 3 or anything but then most people starting out don't really need that sort of thing anyway. I want you to make games. So, that's what I've done. All the resources I have the rights to distribute from the SYNSO series of games and my other title(s) are now available with a few small caveats for you to use in your games. You can use them to write your own entry into the SYNSO universe, use them as placeholders for prototypes of your own title or yes, even use them as final graphics in your own game if you want. Providing you're developing something non-commercial (ie - you don't plan on making money off it in any shape or form), then you don't even need to ask permission. I'll have some proper news on what's happening with SYNSO3 to share soon (it's coming! ), but in the meantime feel free to go and grab yourself some free-ish graphics and sound effects and get making games. I want you to make games, let's do it. So that everyone reads the license involved, I'm hosting all the graphics packs on my homepage rather than on here but feel free to nip along and grab a bunch of free bits and bobs that may/may not be of use to you. It's great of you to do this! You, sir, are awesome. Thank you. Wow, SWEET. Very cool. Thanks to you.